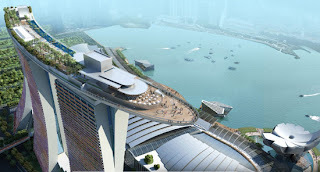 Marina Bay Sands is an integrated resort fronting Marina Bay in Singapore. 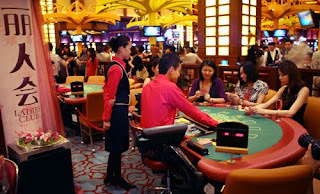 Developed by Las Vegas Sands, it is billed as the world's most expensive standalone casino property at S$8 billion (US$5.7 billion), including cost of the prime land.The resort was officially opened with a two-day celebration on 23 June 2010 at 3.18 pm, after a partial opening earlier in April. More Luxury Hotels in Singapore. With a collection of celebrity chefs, leading fashion, nightlife, and luxury spa operators, extreme sports aficionados, and musical stars on hand, Marina Bay Sands held its Opening Celebration last month, with company officials predicting the property would usher in a new era of international tourism development. said Mr. Sheldon G. Adelson, chairman of Las Vegas Sands Corp.
Marina Bay Sands features three 55-storey hotel towers which were topped out in July 2009. The three towers are connected by a 1 hectare sky terrace on the roof, named Sands SkyPark. 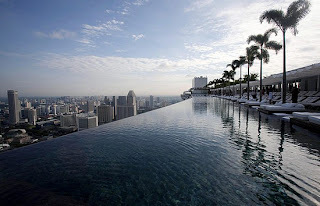 The SkyPark is home to the world's longest elevated swimming pool, with a 150-meter vanishing edge, perched 200 meters above the ground. The pools are made up of 181.6 tonnes of stainless steel and can hold 1440 cubic metres of water. The SkyPark also boasts rooftop restaurants, nightclubs, gardens hundreds of trees and plants and a public observatory with 360-degree views of the Singapore skyline. In front of the three towers include a Theatre Block, a Convention and Exhibition Facilities Block, as well as the Casino Block, which have up to 1000 gaming tables and 1400 slot machines. See more Casinos. The luxury hotel is also provising the best luxury boutiques of Singapore. See more about boutiques hotel.